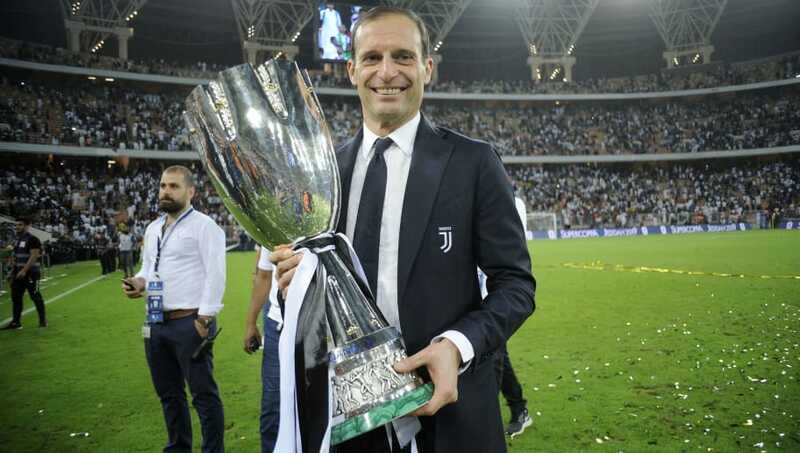 ​Juventus manager Massimiliano Allegri has claimed that the Bianconeri signed Cristiano Ronaldo to give the side a more clinical dimension, following La Vecchia Signora's Supercoppa Italiana victory against Milan in Jeddah. The Portuguese forward headed home in the 61st minute what proved to be the winner between the two sides, as the Rossoneri were reduced to ten men with Franck Kessié seeing red for a high challenge on substitute Emre Can. The goal was the former Real Madrid talisman's 16th of the campaign in all competitions and his eighth in his last seven finals, and Allegri indicated the £105m acquisition was as a result of the 33-year-old's tendency to perform in momentous occasions. As quoted by ​Football Italia, Allegri told Rai Sport: "We signed Cristiano Ronaldo because he is decisive and scores big goals, but the whole team put in a good performance." ​Juve weren't at their best in the opening ten minutes of the game, which was evenly contested in nature, but had gone close through ​Douglas Costa, João Cancelo and Ronaldo. They were fortunate, however, not to have gone behind in the early stages of the second half, as Patrick Cutrone struck the bar with a fierce effort on the turn. However, ​Ronaldo's header from Miralem Pjanić's pin-point cross ultimately gave the Turin outfit the deserved ​win, and clinched a record eighth Supercoppa title for the side. After falling behind, matters got worse for the ​Rossoneri, who were reduced to ten men after Kessié's booking was overturned by VAR for a red card. The dismissal halted Milan's momentum, but Allegri believed that his side could have done more to win the game more convincingly after the opposition's sending-off. "It was an entertaining game with several chances," he added. "We were up against a good Milan that caused us problems, but after the red card we could’ve done better to score a second goal. "It was very warm and tiring, but we deserved to bring home the trophy thanks to a balanced approach." Gennaro Gattuso's men showed great spirit, considering they were playing the final 20 minutes with a man down, and they created a frantic finish, which included having a good appeal for a penalty turned down, three minutes from time, after ​Can impeded substitute Andrea Conti in the area. However, Allegri insisted that Il Diavolo were given the opportunity to threaten due to the Bianconeri moving the ball too quickly and without care. "There were a few too many counter-attacks, as we should've had more moves like the ​Paulo Dybala disallowed goal. Instead, we kept trying to move it around too quickly and allowed Milan some counters, forcing us to sprint back. "Milan played well, we made a few too many mistakes in our passing. It was a good opening half-hour, but Milan were eager and we had chances where we could’ve made it 2-0, but were a bit hasty in the final ball."